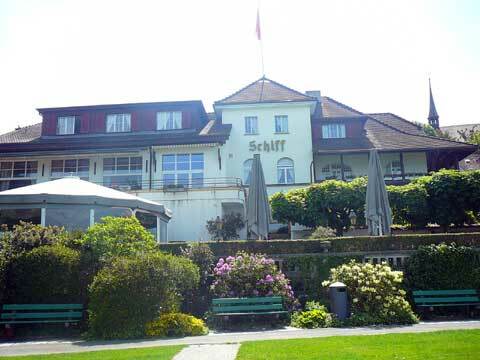 The Hotel Schiff in Murten / Morat is a family hotel that offers 11 double rooms and 4 single rooms with a bath or a shower. Most of the rooms have a wonderful view over Lake Murten and the Jura mountains. All rooms are differently decorated in classic-romantic style and have a flat screen TV. In their reviews, guests of the hotel indicate that they liked the quiet location, the friendly staff and the quality of the breakfast and the restaurant. 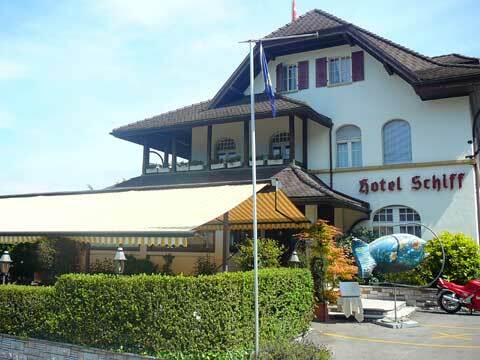 The Hotel Schiff in Murten / Morat has two restaurants. There is a gourmet restaurant that offers some fine French cuisine. The other restaurant offers more simple food with Swiss specialties and pizzas. Both have nice terraces offering a nice view over the lake. We were very pleased with our stay at hotel Schiff conveniently located just oustside the old Murten, which is a plus if you drive with some heavy luggage. The restaurant is good also.